Choosing dog door size is both easier and more difficult than it seems. Easier, because there are great sizing charts, and more difficult, because the right size is often counterintuitive. That is, the right size often looks too small. 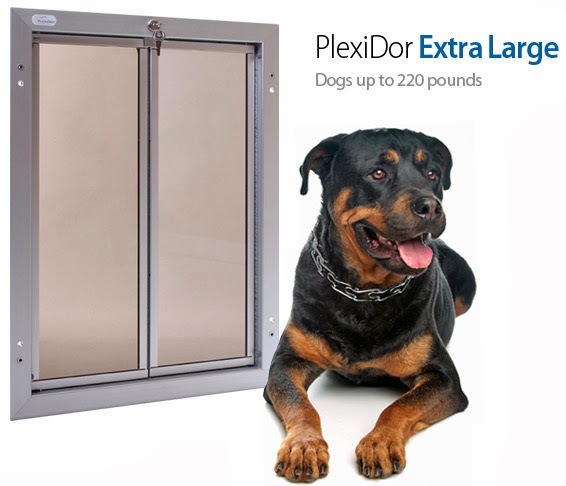 The PlexiDor dog door comes in sizes from small to extra large, and can accommodate everything from the tiniest Chihuahua to Irish Wolfhounds. 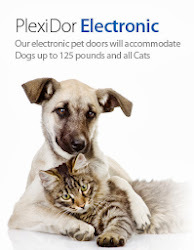 A common error is thinking the door must be as tall as the pet is. For many breeds this would give huge holes in the wall or door. A dog door the size of a Great Dane would be so heavy to open the dogs couldn't get out, and it would be so big that keeping weather outside would be an impossible challenge. Most dogs bow their head and lift their legs when they go through. This means that the door can be much shorter than the dog. Naturally, the door has to be wide enough to let the pet through, and tall enough to fit the pet's torso, but it doesn't have to be as tall as the pet. 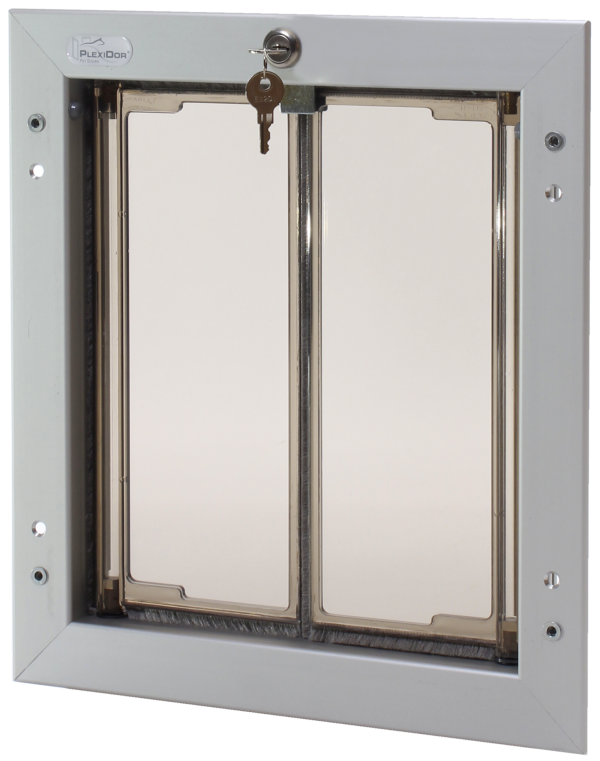 The image top right shows a correctly installed dog door. Note that it isn't installed flush with the floor, and that it looks pretty small compared to the dog. Many have smaller and bigger pets together. The panels on the PlexiDor swing so easily that smaller pets can open the larger doors without problems. 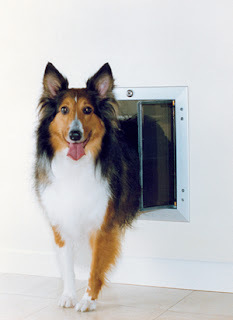 However, you might have to go up one size, because the door needs to be installed low enough for the smaller pets to open, but high enough for the larger pets to go through without crouching. 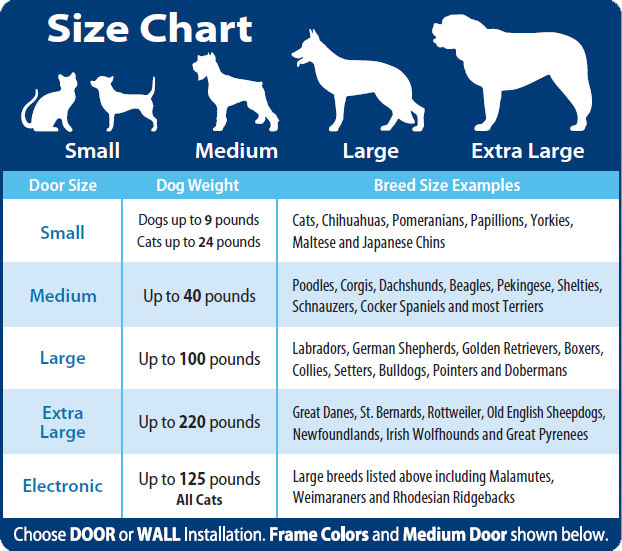 Click here to download a size chart with recommended dog weights and door measurements! If you have questions, don't hesitate to contact customer service. They will help you find the best door for your needs.